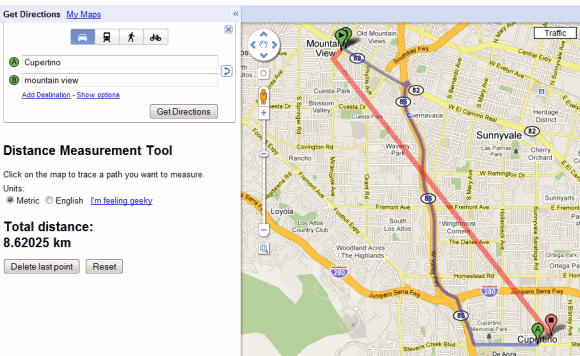 Google Maps Labs added a feature that used to be available as a mapplet: distance measurement tool. After enabling the Labs feature, you'll notice a small ruler at the bottom of the map. Click on the ruler and you'll be able to use the distance measurement tool by clicking on the map and tracing the path you want to measure. If you click on "I'm feeling geeky", you'll be able to pick from a long list of measurement units, including light-year, parsec, PostScript points, Olympic swimming pools, American footbal fields, Persian cubits and more. Thanks for the heads-up on this new lab! BTW, I like the sharing buttons you added to the posts, I hadn't noticed them before. So I looked for it today, not realizing it wasn't supposed to be there, and found it and used it, never realizing what had just happened. This mapplet has been available for a long time. I think I first used it nearly 2 years ago. Guess it was time they added it to Google Maps Labs. Well its not working under firefox, anyone know how to install it? The feature has been available in maps.bing.com, or its predecessor, maps.live.com for several years now. Don't worry, it was available in Google Maps too. It was an option in "My Maps" and a featured mapplet. I'm trying to determine the distance to a BART stop, but the measurement tool doesn't register it when I click on the BART symbol on the map - instead, I get the popup window with the schedule info. I can solve the problem by clicking near and not on the symbol, but there ought to be a way to tell it I want the distance, not the schedule (especially when it's the second click - it already registered my start point in the distance measurement pane). Totally bogus instructions. The only "ruler" at the bottom of the map is the scale bar and the only thing that happens when you click on it is you pan the map. The post is from 2010, things change, especially when it comes to Google. Mapplets are no longer available, but you can use the Google Maps Labs feature. Click "Labs" at the bottom of the Maps page and enable the "Distant Measurement Tool". However the Distant measurement tool TOTALLY "disappears" as you zoom in to image view. I needed to measure the distance between a meter and a fire hydrant. Does not work. At all. Not on Firefox. Not even on Google Chrome, which is just sad. yesterday I deleted map now I want to reinstal that map how and where can get it.